The Beer Store has been demolished and excavation work has commenced! The initial application submitted on April 11, 2016 proposed to amend the former City of North York Zoning By-law 7625 and City-wide Zoning By-law 569-2013 for the lands at 1580 Avenue Road, to permit a 7-storey (24.7 metres exclusive of mechanical penthouse) mixed-use development containing 70 residential units, 725 square metres of commercial space at-grade and 7575 square metres of residential gross floor area, a density of 3.93 times the area of the lot and 129 vehicular parking spaces on 3 levels below grade. The Preliminary Staff Report (attached) was submitted to the next North York Community Council meeting on June 14th. At that time, the Staff were directed to schedule a community consultation meeting (possibly to be held before the end of June, 2016). This meeting was held on June 27, 2017 (just 13 days/9 business days after the NYCC instruction on June 14th) but neither SAHRA nor OOGRA were advised and were therefore unaware of the event. Planning and Urban Design staff met with the applicant to discuss revisions. As of Nov 21, 2016 they were awaiting a re-submission. A revised proposal was submitted on Dec 23, 2016 for a 45-unit condominium. This proposal still called for zoning by-law amendments due to the Avenue Road angular plane requirements not being met, increased height over the allowed of 22.5m; the west side of the building penetrating the angular plane and an increased FSI of 3.83 versus the allowed of 3.0. Staff were in the midst of the second submission review as of Feb, 2017. On May 31, 2017 the Planner advised that there needs to be at least one additional submission to eliminate the outstanding issues so it would likely be Fall, 2017 for it being presented at the North York Community Council meeting. A revised proposal was then submitted on July 26, 2017 now for a 36-unit condominium. The proposal was presented at the Oct 17, 2017 meeting of the North York Community Council. The Staff Report from Planning dated Oct 10, 2017 recommended approval of the proposal despite the fact that the proposed height is 29.5m (versus 24.5 which is permitted by By-law 569-2013) and the densification is 4.77 times the area of the lot (versus the allowed of 3.0/stated in Apr, 2016 to be 3.93 and then stated in Dec, 2016 to be 3.83). But the Staff Report maintained that the plans had to be revised to be contained within a 45 degree angular plane projected over the entire lot from the surface of the centre-point of the Avenue Road Right-of-Way. SAHRA submitted a letter stating that in general, we believed the Owner and the City had brought forward a project that is largely consistent with the spirit of the Avenue Road Avenue Study. However, we agreed with Planning’s Recommendation that the project plans needed to be revised to be contained within a 45 degree angular plane projected over the entire lot from the surface of the centre-point of the Avenue Road right-of-way, in keeping with By-law 569-2013 and the Avenue Road Avenue Study guidelines. The developer’s lawyer deputed against this requirement at the meeting; OOGRA deputed on the importance to Upper Avenue that the angular plane be maintained. Councillor Carmichael Greb then put forward a Motion that the Staff Report recommendations be accepted with the DELETION of the requirement for the 45 degree angular plane off Avenue Road. It was Approved! SAHRA and OOGRA were not aware that the Councillor intended to modify Planning’s recommendation. We are very disappointed with this outcome and frustrated with the Zoning Amendment/NYCC process. City Council approved the Zoning Amendment Application for 1580 Avenue Road on Nov 7, 2017 and the Zoning By-law changes were made on Nov 22, 2017. Where is the Section 37 money going? “The Old Orchard Grove Ratepayers’ Association (OOGRA) represents residents of the Upper Avenue Road area. 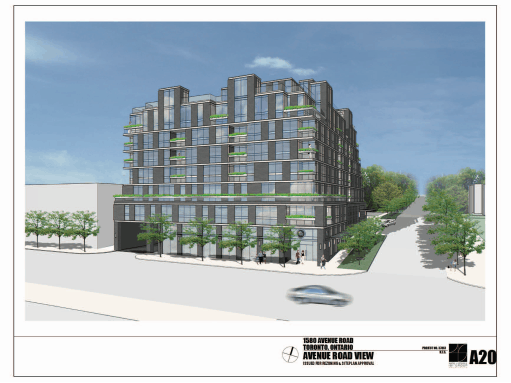 North York City Council approved in October 2017 a 7 storey, 36 unit condo development at 1580 Avenue Road (the former Beer Store Property) which includes Section 37 monies of $694,000 going towards park and streetscape improvements. Section 37 money is paid by developers in trade for deviations from zoning rules. France Rochette, Chair of OOGRA attended the NYCC meeting to request that the development comply with the 45 degree angular plane rule facing Avenue Road as well as to request that the Community be consulted on how to direct this very significant Section 37 contribution. Both requests were turned down by Councillor Carmichael Greb whose motion, prepared in advance of the NYCC, was in contempt of a staff report recommendation that the 45 degree angle be respected. Rochette has expressed deep concern with Section 37 monies: There is a lack of transparency regarding Section 37 funds and the funds are not benefitting residents most impacted by the development. For example, funds associated with The Brookdale were directed to Allenby playground upgrades over 2 km away, while funds from the York Mills and Yonge development, 3 km away, were redirected to Old Orchard Park by Councillor Carmichael Greb. However, in the Allenby school case, she had firmly told residents that once funds were allocated, they couldn’t be redirected. We denounce the mysterious assessment of these funds and the opaque decision making process for use of the funds. With construction started $694,000 is now available for the benefit of the Community.